The first Father’s Day was celebrated in 1910 in Spokane, Washington. It was considered a partner to the older holiday Mother’s Day, which began about two years earlier. The celebration spread, but despite some presidential support (Woodrow Wilson in 1913 and Calvin Coolidge in 1924) and the push by a Senator(Margaret Chase Smith in 1957), the idea of a national holiday to celebrate fathers never became an official national observance. That was until 1966, when President Lyndon Johnson issued the first presidential proclamation recognizing the third Sunday in June as Father’s Day. Six years later, President Richard Nixon made Father’s Day a permanent national holiday. 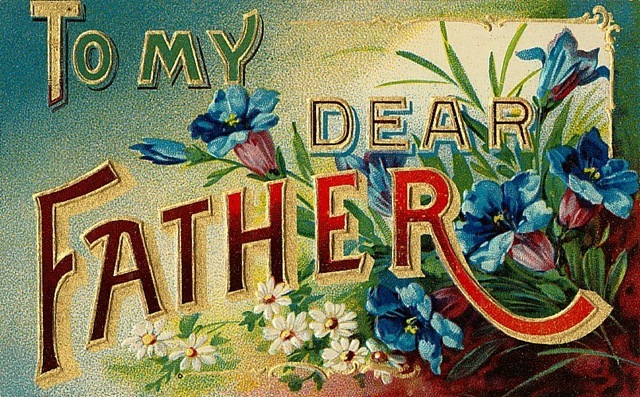 This 1940s-era Father’s Day card come from the website Vintage Holiday Crafts.